With an impressive deck space and an armada of tenders and toys, there’s never a dull moment on board ANDIAMO. Some of the standout features, an enlarged sundeck with wrap around seating and giant sunpad. Plenty of indoor and outdoor dining areas including a formal dining table with seating for 10. ANDIAMO’s skylounge features wrap around glass to enjoy a morning cup of coffee while planning out your day or enjoying an evening cocktail to end a day in the sun. ANDIAMO’s tender and water toy collection promises hours of entertainment, including jet skis, a 32’ Jupiter, fishing & snorkeling equipment and a small RIB. 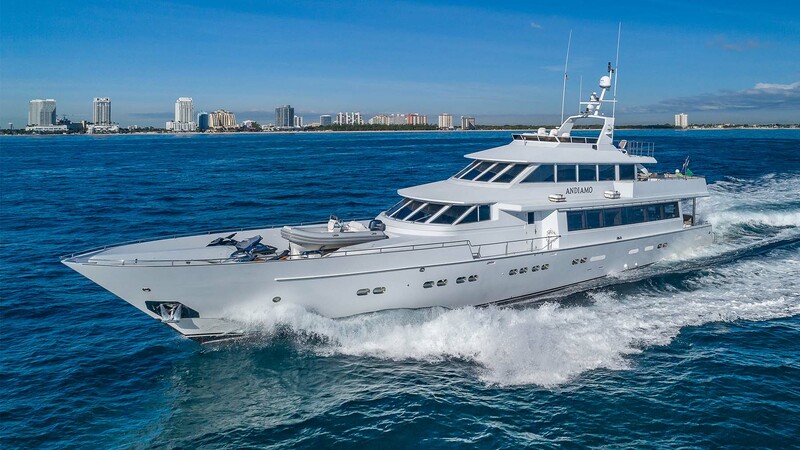 The only thing you will wish for on a week charter aboard ANDIAMO is more time!